Roca del Skip (Skip’s Rock) is a dramatic spire at the southern end of Isla Guadalupe (Guadalupe Island) named in honor of the man who has videotaped and explored the submarine haunts of Guadalupe Island more than anyone else. Church Rock (left) and Roca del Skip (Skips Rock, right), near Isla Adentro. Harrison “Skip” Stubbs, Ph. D. has logged hundreds of hours diving at Guadalupe Island annually since 1992 during expeditions that he has organized to explore the island and appreciate its marine inhabitants and spectacular geologic features. Guadalupe Island is surrounded with dozens of underwater spires, offshore rocks, islets and islands. The southern end of Guadalupe Island hosts four noteworthy and diveable rocks, all of which we have dived repeatedly. Most significant are Isla Adentro and Isla Afuera, both of which are large, dramatic islands with spectacular vertical underwater terrain for divers to explore. Next to Adentro is the much smaller Church Rock which, like its larger brethren, is sheer on all sides and exposed to open ocean swells and currents, making for some exciting submarine conditions. And finally there is Roca del Skip (Skip’s Rock), a granite spire that rises out of 150′ of water to break the surface. It is too difficult to anchor at Roca del Skip, indeed it is tricky enough to anchor near Church Rock. So we take a skiff from the big boat over to Roca del Skip and splash in, then quick! race down into the lee of the rock before the current grabs hold. 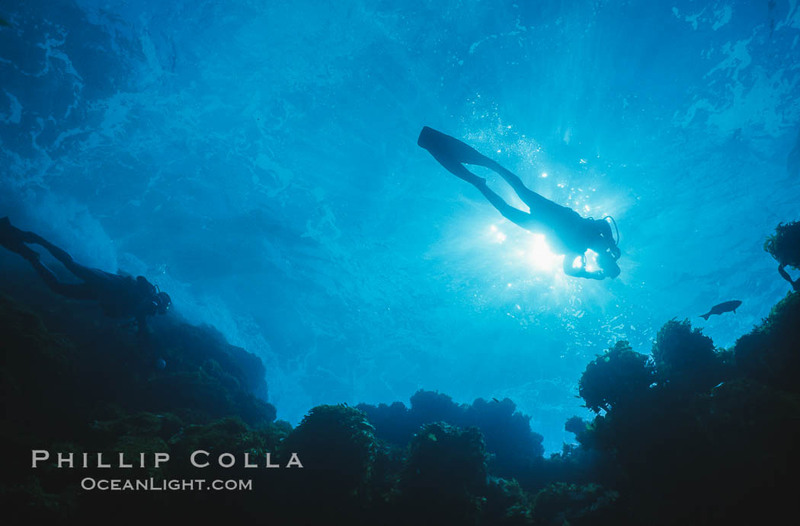 Roca del Skip is vertical on three sides, clean granite that glows in the sunlight and is spotted with Scythe butterflyfish and Guadalupe cardinalfish. The walls drop to 150′ and a ridge of granite extends out toward open sea from the base, as far as one can see which is usually 150′ or more in the clear waters there. On its other side Roca del Skip has a broad shoulder covered with low-lying algae that sways in passing swells and is home to schools of Azurina, blacksmith and chubb. Roca del Skip is close enough to Church Rock that one can make the swim underwater. We shoot the gap from Roca del Skip to Church at least once each trip if we can. Shoot the gap (n.): “swim at depth from one rock to the other without any bottom structure in sight”. I like to do it without a compass. (Compass navigation is for people who log their dives and check their air pressure; I don’t know any people like that.) This holistic approach is referred to in diving magazines as “navigation using natural features” except in this case there are no natural features to reference. Its fun and stupid this way, relying on the angle of the sun and the seat of one’s pants to guess which direction to head. It should be noted that, given certain known biohazards at Guadalupe, shooting the gap yields a sense of comfort akin to what a bait must feel like when it has become separated from its school and hears tuna approaching. As an added bonus, if a wrong heading from Roca del Skip causes one to miss Church Rock entirely and the currents grab hold, the next stop is Tahiti. There have been a few times after leaving Skip’s Rock behind that we’ve been swimming the gap for what seemed like too long, 70′ deep and without “natural features” upon which to base our “navigation”, before the hazy glow of Church Rock begins to show in the distance ahead. We burn what remains of our air along the walls and shoulders of Church Rock before the skiff arrives to pick us up. 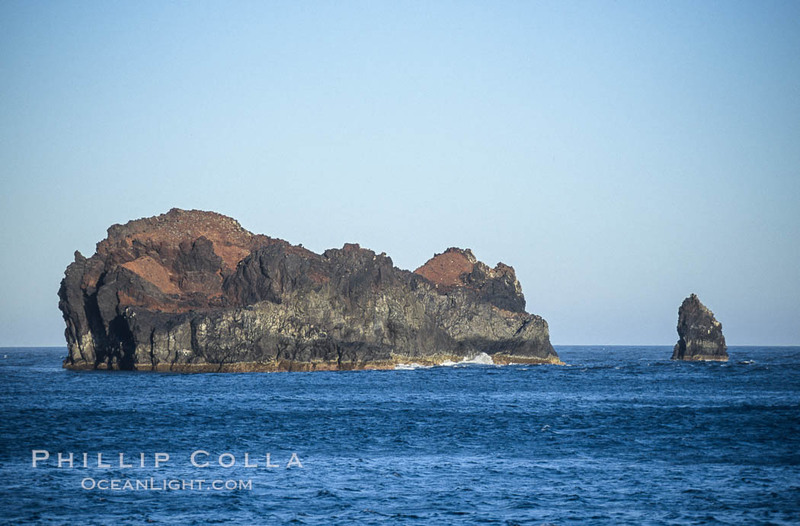 Lots more Guadalupe Island photos. Roca del Skip appears in the Guadalupe Island entry on Wikipedia so it must be official, right. ?